Breakfast: Boiled chicken ovulations. De-licious. Hangovers? Bah! We laugh in the face of hangovers... but not too loudly, please. And come to think of it, where did this traffic cone, policewoman's hat and suspenders come from? Oh well, it's nothing one final refreshing breakfast in the hotel restaurant can't put right. Listen. Can anyone hear anything? No? That's because there are no sounds to hear. Now, at DJ, this usually signifies one of two things - either someone or something important backstage is just moments away from being revealed... or someone's Space Mumps are starting to gurgle on the back row. Thankfully for all concerned, this thrillingly mysterious presence turned out to be a perma-goateed Mancunian writer looking for his next big break. Or perhaps to put it another way, precisely one-half of the gestalt entity which unleashed Red Dwarf unto the world... Doug Naylor. For weeks beforehand, there had been rumblings on Twitter and beyond surrounding a rare, fabled appearance from Doug, and for the first time in what seemed like four leap ice ages (he last took the stage in 1997) he had indeed finally returned to DJ. 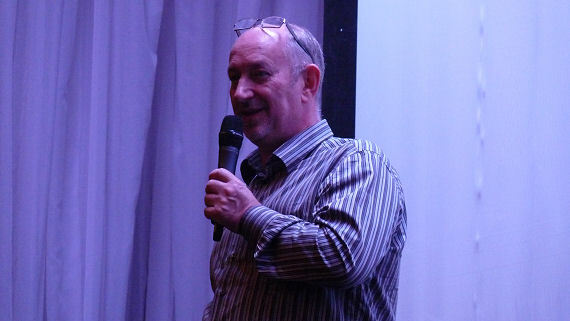 Consciously or not, everyone knew that he wouldn't have made the trip up to Brum just for a quick chinwag. He was here to tell us some news. News with a capital 'N'. 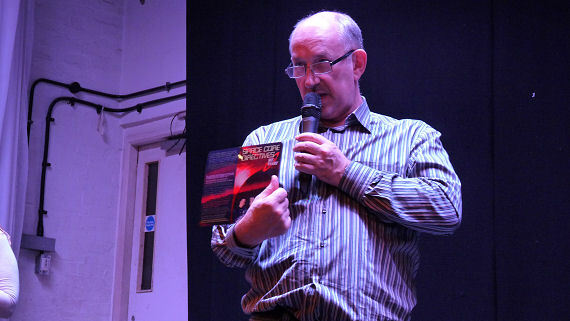 Confidently stepping out into the spotlight, Doug reads aloud a press release from Dave announcing the ever-so-slightly encouraging news that Red Dwarf: Series X is due to start filming later on this year - set for broadcast in late 2012. Preventing story-leaks for the new series remains top priority for Doug, especially as the proposed stage they'll be shooting on has unlimited Wi-Fi access, "A joke I used to make about Bobby tweeting on set is actually now quite possible." Treating us all to a teaser trailer for the first episode of a brand new series he's been developing independently called Over to Bill, Doug proves he can still have a crowd in stitches with characters and scenarios they've never seen before. After being advised by a fellow industry bigwig to show the pilot to the BBC, he recalls, "You're not going to believe this when I say it, because it's so ridiculous it's got to be true. The rejection letter from the BBC contained the line, 'There are men in it, and we've already got things with men in.'" 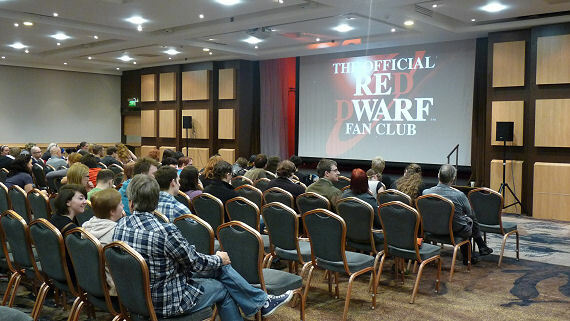 Among a plethora of Red Dwarf-related anecdotes, Doug talks of £100,000 model budgets that came and went in the early days, which would come in more than handy today, "If anyone in the audience has a few million - tweet me!" 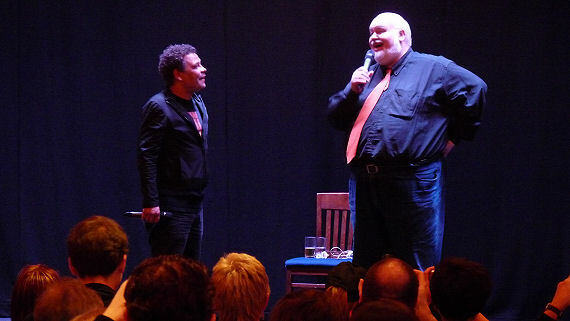 After wowing the crowds back in 2009, last human in the cosmos Craig Charles was back for seconds. And if that wasn't enough, the incomparable Danny John-Jules - a man simply born for the stage (or was the stage born for Danny John-Jules?) would be joining us too. Remember, you can't spell DJ without DJ-J. Erm, sort-of. Bounding onto the boards with the kind of energy usually contained behind the humming brace of a Cadmium II drive plate, both Danny and the ever-grinning Craig were met with a wall of sound before they even had a chance to register the size of the applauding crowd before them. 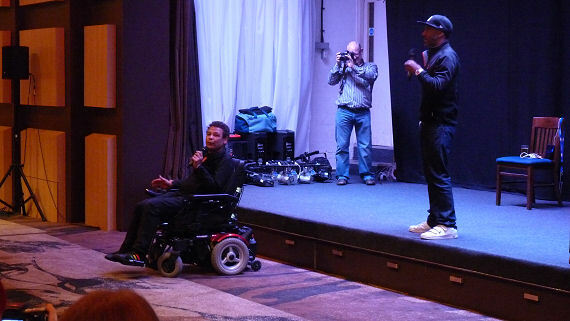 In a truly unprecedented turn of events, Craig decided to kick things off by commandeering someone's wheelchair. No, seriously. 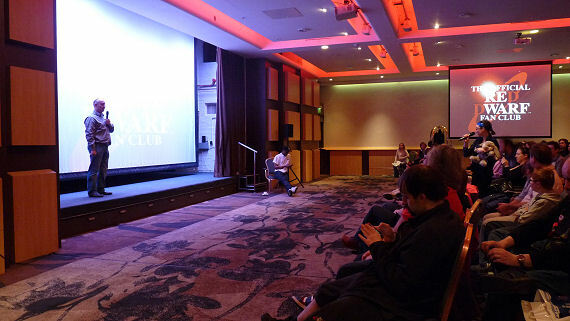 Turfing out the poor attendee onto a nearby seat, Craig proceeded to push the vehicle's modest motor past its limits - at one point lifting at least three of the wheelchair's four wheels before skidding to a halt, and calling for a round of applause for his wide-eyed victim, for being such a good sport. Personally, I wouldn't have been surprised if someone had found a script backstage for Craig and Danny's routine. Clearly indicative of a lasting and much-loved friendship, the pair bounced off each other's words with aplomb and had the crowd creased-up from start to finish. 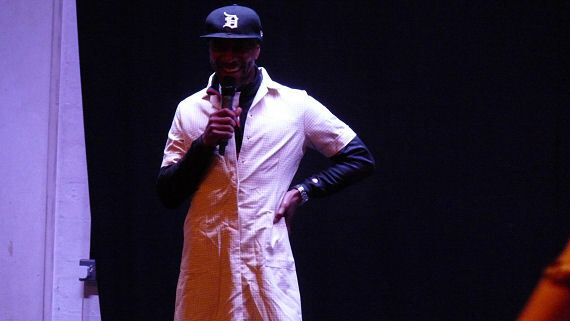 At one point, Danny is handed a screen-used nurse's costume he wore in Series VIII which the crowd promptly encourage him to try on, "Craig, what's going on, mate? Deary me." Romantic music filters through the sound system, which stops Craig dead in his tracks. From the back row, Stephen Wickham arrives to fight for the love of his life - it's the GELF wedding night all over again! It's a moment of amorous uproar, and as the crowd go bonkers Steve manages to steal a hug and a kiss from the not-easily-embarrassed Mr. Charles. The question, "Can you not just talk like the Cat?" causes Danny to raise an eyebrow. "This is the voice I use when I'm not being paid." Meanwhile, Craig ventures out into the crowd in search of a comfy seat, meeting and greeting the crowd, before he and Danny hang back to kick-start the Auction. 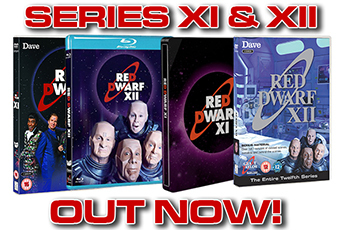 It can be a real coup to become custodian of a singular piece of memorabilia from your favourite TV show/movie. The only problem is that such rarity often comes with a hefty price tag, and occasionally you're forced to sell your home in order to make the down-payment. This, in turn, can further complicate matters - particularly if you were intending on displaying said piece on a shelf to enjoy at a later date. 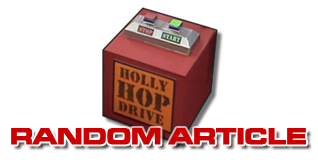 Thankfully, you can pick up an absolute bargain at DJ from time to time, from difficult to find (see: ancient) pieces of now unattainable merchandise to actual screen-used props and costumes from past series (see: no longer fashionable). All you have to do is attend the Auction, hold your nerve and keep your fingers well and truly crossed! 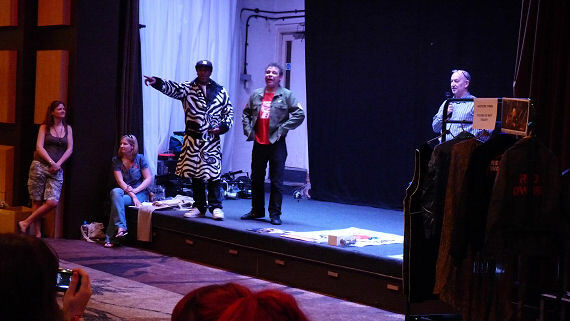 Orchestrating the final bidding war of the weekend, Doug Naylor returned to the stage and singularly managed to shift every single item - from prototype mouse mats to Rimmer's actual, screen-used jacket from The End. 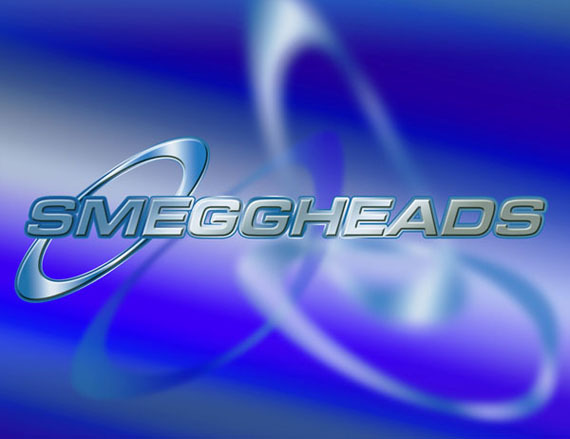 Now, all that's left is Red Dwarf super-quiz, Smeggheads - based on (okay, ripped off from) the TV series of similar name. It's a bit of a jolly to round out a day of photographs, autographs and other words ending in 'graphs'. The final result between the two teams - a set of attending fans versus various Club, GNP and fan site staffers - goes, just, to the staffers. Though by this stage, let's face it, we were all too tired to care! And so Dimension Jump XVI reluctantly drew to a close. 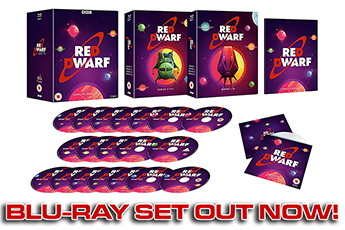 After all the laughs, good times, and not forgetting this year's Big AnnouncementTM that the new series of Red Dwarf is set to start filming, hopefully by the end of the year, the phrase 'ending on an up' had never seemed quite so appropriate. Roll on, DJ XVII. 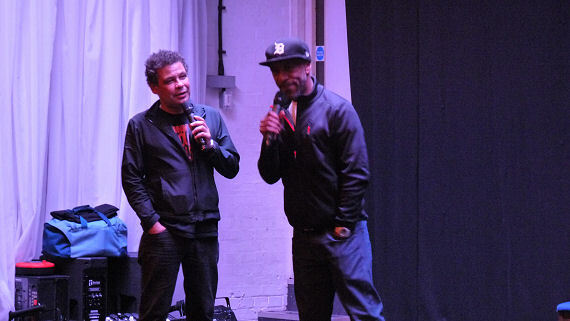 The Boys from The Dwarf are back. Funny. It's almost feels like they never left.